This is one of those books that really resonated with me. It’s a gritty, emotional story of a relationship between two men who don’t really let themselves do emotions or relationships. As the only law enforcement officers in an enormous and inhospitable rural area, the intimacy between Gio and Jason is initially forced and uncomfortable. Gio is running from his past in the city and Jason is still grieving his wife. The relationship between Jason and Gio develops slowly. They slowly start to trust each other on the job. When Jason struggles to care for his son while working too many hours, he is slowly forced to trust Gio with his son. But while the relationship is slow, Gio’s new life in the outback is surprisingly entertaining and often exciting. His adventures wrangling poisonous snakes, naked pensioners, and abusive partners are told with both sensitivity and humour. I don’t think this book fits neatly within the romance genre, but I personally like it better because it doesn’t. It’s a book about two lives that are forced together in difficult circumstances. It’s a book about reevaluating life choices and ambitions when our best laid plans fall apart. And it is a book about love and relationships – but not necessarily about romance in the way we’ve come to expect it. I loved this story and I’m looking forward to more in the series. This story is sublime. I love the authenticity of the characters, the location, the language. (Thank you, Ms. Henry, for writing Aussies that actually sound like Aussies.) I loved watching Gio adjust from life as a city cop to life in the outback while dealing with the trouble he left behind on the Gold Coast. Jason juggling work as a cop with life as a single parent pulled at my heart strings. And I loved Taylor, Jason’s son – 10 years old, inquisitive, and fun. And most of all, I loved the way the relationship between Jason and Gio grew and developed and didn’t go according to plan and that their feelings are portrayed so simply. Two Man Station hit the spot for me. I know next time I’m driving through a small country town in the bush and I pass the cop shop that I’ll be thinking of Jason and Gio. This is the third book I’ve read by this author and each of them is vastly different and each of them was a five-star read. I’m going to have to find the time to check out more of her work. She is an author not to be missed. 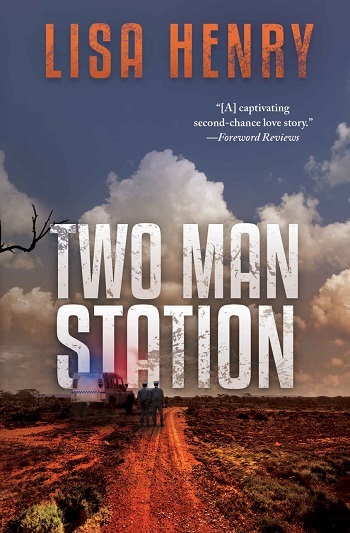 Reviewers on the Wicked Reads Review Team were provided a free copy of Two Man Station (Emergency Services #1) by Lisa Henry to read and review.